This presentation was generated by Fluor Hanford for the U.S. Department of Energy. The main point of this presentation is that the neutral wire (typically white in color) is unfortunately named in a way that implies it is harmless. Most people know that if you touch the black (or red or blue) wire, chances are you are going to receive an electrical shock. They also believe that it is safe to touch the white (neutral wire). Under most conditions, this is true. However, that is only so if the path your body makes to ground is a significantly higher resistance to current flow than what the neutral wire path provides. This requires the neutral wire to have a complete path back to the service panel. If the neutral wire somehow gets disconnected from the neutral bar in the panel, your body becomes the only return path to ground for the electrical current. Neutrals are grounded but carry current under load. The source of neutral current cannot always be identified. Breaking a neutral under load could create a shock hazard. Individuals contacting a lifted neutral potentially provide an alternate path to ground. A broken neutral or lifted neutral could result in a shock or an arc. 3 current carrying conductors in a raceway. Copper ground wire omitted for simplicity. Highlighted in yellow indicates energized. The Multi-Wire Branch Circuit is an acceptable configuration according to the National Electrical Code (NEC) Section 210.4. These circuits are typically found on 120 / 240 volt single phase systems, but can be found on 208Y /120 and 277Y / 480 volt systems as well. Measure absence of voltage to ground immediately after lifting leads when more than one neutral is lifted from a device or when a splice is broken. If known, Lock out both / all load breakers. If both circuit breakers in a multi-wire branch circuit are not known? Test the neutral circuit with a clamp-on type current detector to identify if the neutral is carrying current before lifting neutral leads or breaking a neutral connection. NOTE: Current will exist only if one or more circuits sharing the neutral have a load energized at the time of measurement. Stop work and remove the hazardous condition or plan a new work package considering known energized conductors. It should be corrected by installation of pigtails or other means, to maintain continuity of the neutral wiring in accordance with NFPA 70 National Electrical Code. 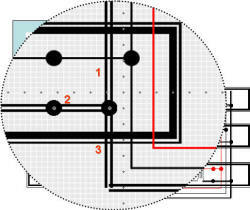 Label the doors of lighting and power panels where common neutrals are known to exist. This will alert LOTO planners and workers of potential problems. 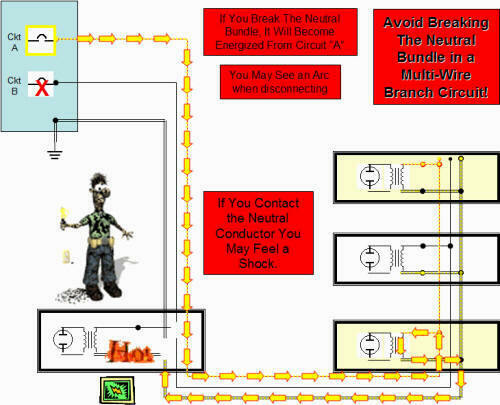 Provide instructions in work packages where common neutrals are known to exist to remind workers to be alert to wiring that may indicate a common neutral and to maintain neutral circuit continuity. Suspect a multi-wire branch circuit when three or more neutral conductors are spliced together in a junction box, outlet box, or lighting fixture. Note: Some of the original PowerPoint slides contained animations, which have been omitted here. No important information is lost in the process.